Togari Kaalu Saaru is a Masala gravy with fantastic flavor prepared in a perfect Karnataka Style. Green Pigeon peas or Togari Kai or Togari Kaalu is the fresh and greenish form of Toordal/Togari Bele/Tuvaram Paruppu. It comes inside a green pocket similar to green peas and the outer cover needs to be removed to get Togari Kaalus. The dried and processed Togarikaalus are the regular Toor dal that we use in sambar and dal varieties. I bought 1/2 kg Togari Kaalus with the outer cover and after removing the outer cover it weighed around 1/4 kg. You can even buy the cover removed Togari Kaalus in the market but generally, the roadside vendors in Bangalore sell them with the outer cover. Since I wanted to click a pic for my blog I bought them with the outer cover. Also, I have used Byadagi Chilli in this recipe. It is a famous chilli that has been used in almost all the dishes and especially in Karnataka's most famous dish "Bisi Bele Bath". Similar to Kashmiri Chilli, it is less spicy compared to normal red chilies and gives bright red color to the dish. This recipe "Togari Kaalu Saaru" is prepared in many ways, some prefer to add tamarind to this gravy to prepare it in a sambar style and some might prefer to add sambar powder instead of grinding the fresh spices. Since I got this recipe from my Kannadiga friend, I didn't make changes and followed the same procedure of hers. She told me that this dish is a perfect pair for Ragi mudde, Rice and even for dosa, idli and chapathis. If you are curious to know more about these tiny green seeds then you do have a great news. 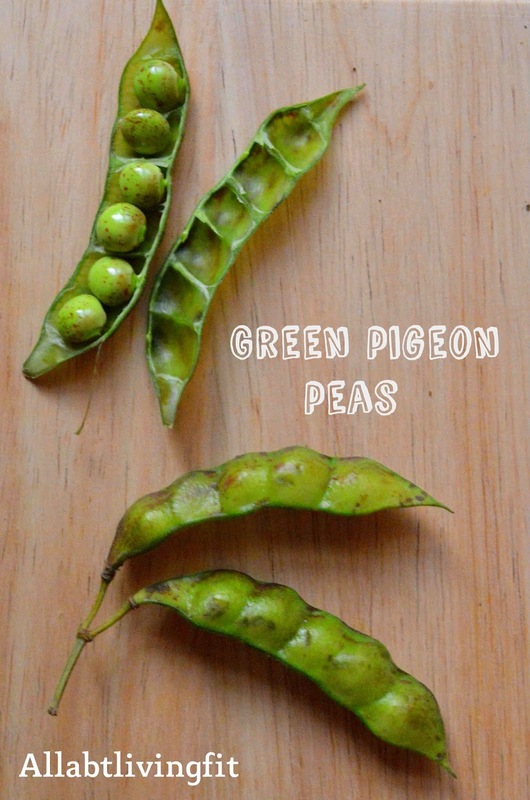 There are some interesting facts hidden in Green Pigeon Peas/TogariKaalu, click on the picture to know them. Try these recipes and send me your comments:). 1) Wash the Togarikaalu/Green Pigeon Peas and pressure cook with enough water for 2 whistles. Make sure to cook in a way that they turn soft but not mashed up. 2) Heat a wok/Tawa and dry roast cinnamon, cloves and cardamom in low flame till nice aroma arises. 3) Transfer the roasted spices to a plate and in the same kadai, add Corriander seeds and red chillies to fry till nice coriander aroma arises. Once done, transfer them to the same plate and add grated coconut to the kadai to fry till light brown in the low flame. 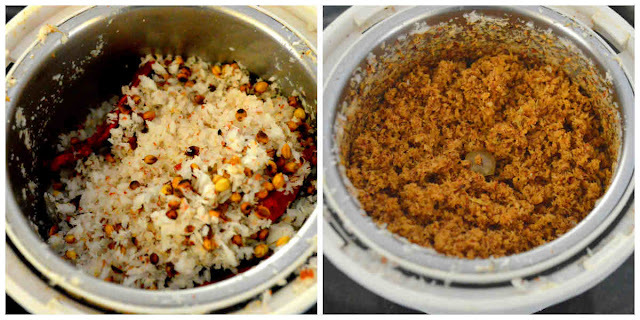 4) Grind all the roasted spices and coconut to a coarse powder. 5) Heat 2 tablespoons oil in the same kadai and add onions to fry till light brown, next add ginger garlic paste and fry. 6) Next, add tomatoes and fry till they turn soft. Transfer the onion-tomato mixture to a plate and leave them to cool down for few minutes. 7) In the same mixer in which you have ground the spices, transfer the cooled onion-tomato mixture, coriander leaves and few cooked Togari kaalu to grind to a fine paste. 8) Once the paste is ready, heat 2 tablespoons oil in the kadai and add mustard seeds and cumin seeds to crackle. 9) Next, add curry leaves and do a quick stir. Add finely chopped onions and fry till light brown. 10) Add the cooked Togarikaalu along with the water and add 2 more cups of water. 11) Add salt, hing and leave it to boil for few minutes. 12) After about 5 minutes of boiling, add the ground masala paste to the togarikaalu. 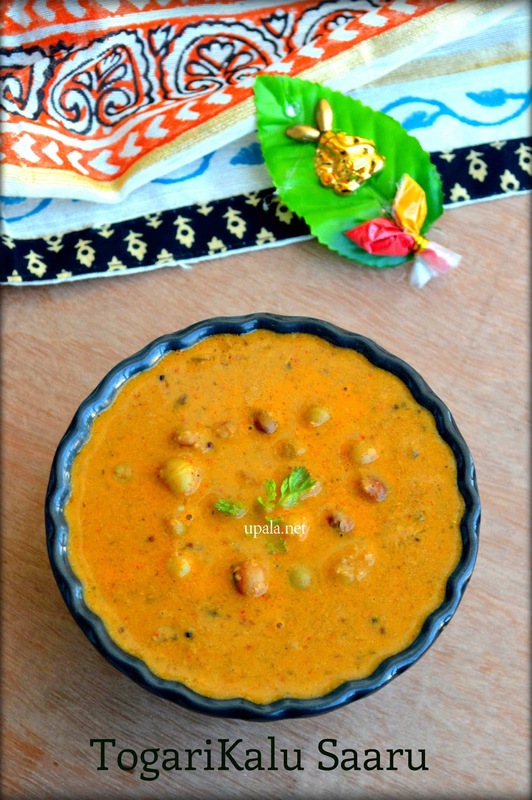 13) After adding the masala paste, mix well and leave it to boil in low flame for 5 minutes. Once done, switch off the flame. Yummy Togarikaalu Saaru is ready. 1) If the gravy thickens after some time, you can add water to adjust the consistency accordingly you need to add few more salt too. 2) If you don't want to grind fresh coriander leaves, you can finely chop them and garnish at the last stage. 3) Grinding few cooked togarikaalus with masala gives thickness to the gravy.